That is COLD! It doesn't get that cold around my parts but I'm currently adding a few trees around the house (property) to break up the wind. Yeah, yeah ... it may take a few years for them to grow but one needs to start somewhere. I'm glad to see that you are starting to use the Daily Diary. If you have any ideas on improving it please post them here. We made a lot of changes ... let me know if you run into any more issues. If you can share a screenshot ... or steps in how to recreate your issue. Thanks. If you run into any bugs just post them here. I'll gladly take them away from you and SQUASH THEM. The What's New and Search are going through a process that I call search index processing. All this means is that it's going through all the past posts and creating an index. Upon completion, the system will be able to provide you with great search results. At the same time, this index is used to display the What's New and other parts of the site. Thank you for your patience. Good day to everyone!! The Daily Diary got a new face. This is just the start in how we plan to improve the Daily Diary. In the next 12 months, expect some new features. For now, just post away like you previously did before. Every member can participate in the Daily Diary. If you have any question(s) not listed below please contact us via our Help Desk. Q) Do you offer medical advice? We are not a medical advice web site. If you are seeking advice for an illness or injury, please contact your healthcare provider. We are a networking community for nurses, nursing students, and educators. Q) Do you charge for membership? Membership is completely free. But, we do offer Paid Memberships for those who wish to personalize their experience on the site. To learn more about our membership visit Need More Options? Upgrade! Q) Can we use your cartoons on our site? You are free to share our cartoons on your website or social networking account as long as you don't make changes to them. If you want to use for anything else please contact our Help Desk. Q) Can we promote our website/product? Please do not post messages on the site that are primarily for promotion or advertising of any website or products (ie. no self-promotion). If you have a product or website that you want to promote please contact our Help Desk. Q) How can we get listed in your (Schools/Products) Directories? Our goal with our directories is to provide enough information to empower our readers to make a decision. We do this by providing a detailed overview and allowing our members to share their own experience/review. If you would like to add your school please submit a request via our School Directory Request form. If you would like to add your product please submit a request via our Product Directory Request form. Q) How can we get our products listed in the allnurses Magazine? The best way to have your product considered for publication in allnurses Magazine is to submit your product for inclusion in our Products Directory. We select products from there for inclusion in future issues of our magazine. Q) Can you delete my account? You can submit a request to remove your personal information. The following occurs whenever we receive a request to remove an account: Rename the account to Guest or Anonymous. Stop all emails Remove all personal information Close account Once an account is closed it cannot be reopened. IMPORTANT: It does not include removing posts (ie. Topics/Comments). Whenever we remove posts it disrupts conversations on the site. The community gets upset because they took the time to participate in your messages. Q) How do I delete my posts? Only staff can delete posts. Deletion requests are not always granted as it disrupts the continuity on the boards. There are exceptions including removal of personal identifiable information. To maintain your anonymity, we will consider removing or editing the topic. If you would like a thread/post removed please Contact Us with your request. State a reason for deletion and staff will get back to you. Q) How can I reset/change my password/user ID? You can use our Lost Password Recovery Form to create a new password. Upon submission, a new password and your username will be sent to you using the email on your account. If you experience difficulty with this, please contact the Help Desk. To change your password/email/user name, you must log into your account first. Look for your username in the upper right-hand corner of any page. Click on it, then click SETTINGS or DASHBOARD. On the next screen click the dropdown menu arrow on VIEW ALL ACCOUNT OPTIONS. Scroll down the list and click EDIT LOGIN / PASSWORD. Enter your current password, then follow the directions to make changes for password, email address and/or user name, scroll and SAVE CHANGES. If you are on mobile and want to make a change, look in the upper right of any page to find 3 horizontal lines (MENU). Click that and scroll to the bottom of the page to make changes under ACCOUNT. Or look for ACCOUNT link. If you have problems making the changes yourself, please post a confidential ticket via the Admin Office. Look to the left and click: Add Your Topic Now! Include any details necessary to make changes. To request a username change, please submit 3 unique usernames of your choice, and we will be happy to do this for you. The Admin Office is a private forum just between you and the Administrators. It is not a public forum. Q) How do I cancel my Paid Membership (Recurring Subscription)? You can cancel your Paypal recurring subscription via the Membership Upgrade page. In the Active Subscription section, you will find a column named Recurring Status. Our system will show you the status of your subscription - Active, Canceled, or Off. (image below) If you want to CANCEL a subscription just click the Cancel Status link. You will be taken to your Paypal account with instructions on how to cancel. If that doesn't work you may cancel directly through Paypal. Log in to your PayPal account. Click Profile near the top of the page. Click My money. Click Update in the My preapproved payments section. Click Cancel or Cancel automatic billing and follow the instructions. Allnurses.com INC, expects users of allnurses.com to respect the intellectual property rights of owners of content found on websites, and other protected works. It's our policy—in appropriate circumstances and at our sole discretion—to disable or ban the accounts of people who repeatedly infringe or violate the intellectual property rights of nonconsenting owners. In keeping with the Digital Millennium Copyright Act (DMCA), which you can read at the US Copyright Office website, we'll respond quickly to claims of copyright infringement as well as trademark violations on Allnurses.com, Inc that are reported to our designated agent, identified below. If you are a copyright owner, trademark holder or authorized to act on behalf of one, you can report alleged intellectual property rights infringements and violations found on Allnurses.com, Inc by completing the requested information and sending it to our designated agent. When we get your DMCA notice, we'll take whatever action we think is appropriate, which may or may not include removing the reported content from Allnurses.com, Inc. If we remove content in response to a DMCA notice, we may notify the person who posted it on Allnurses.com, Inc so they have the opportunity to send a counter-notice. We may also send a complete copy of the notice to others, as appropriate. Submit A Copyright Or Trademark Complaint To submit a DMCA notice, please send the following information to our designated copyright agent: Identify the work you believe has been infringed. If you're reporting multiple violations, you can provide a representative list of those copyrighted or trademarked works. Identify the content on Allnurses.com, Inc you claim to be infringing your rights, including the information we need to help us find it, like the URL to the page on Allnurses.com, Inc. Provide your mailing address, phone number and email address. Include both of these statements in the body of your notice: "I hereby state that I have a good faith belief that the disputed use of the copyrighted material or reference or link to such material is not authorized by the copyright owner, its agent, or the law (for example, as a fair use)." "I hereby state that the information in this notice is accurate and, under penalty of perjury, that I'm the owner, or authorized to act on behalf of the owner of the intellectual property or of an exclusive right under the copyright that's allegedly infringed." Include your full legal name and your electronic or physical signature (for example, by typing your full name). If the work you're reporting is an article, add at the beginning of your notice 'Remove Content'. If the work you're reporting is an image, add at the beginning of your notice 'Remove Image'. Send Your Completed DMCA Notice To: Allnurses.com, Inc Atten: Copyright Agent 7900 International Dr #300 Minneapolis, MN 55425 Email: dmca@allnurses.com Use Copyright or Trademark Infringement in subject line Note: This email address should only be used for copyright or trademark complaints. If you need to get in touch with us for any other reason, please visit our Help Center. What if I get an intellectual property complaint (DMCA) notification? If you've gotten a notification that one of your posts has been removed for a copyright or trademark complaint, it means the content owner asked us to remove it. If you want us to forward the information from the complaint notification, just email us at dmca@allnurses.com to let us know (we may remove some personal contact information). In our sole discretion, if your account gets too many copyright complaints, you could lose the ability to post on Allnurses.com, Inc, or we may ban your account altogether. If you think we made a mistake removing your post, you can file a counter-notice. When we get a valid counter-notice, we'll remove the complaint from your account's record. Note: There are legal and financial consequences for fraudulent or bad faith counter-notices. Before submitting a counter-notice, make sure you have a good faith belief that we removed the content in error, and that you understand the repercussions of submitting a false claim. How to file a counter-notice Email your counter-notice dmca@allnurses.com , and include all of the following: Your name, address and phone number. The DMCA ID found at the bottom of the notification email. The web address of the content we removed (copy and paste the link from the notification email). A statement under penalty of perjury that you have a good faith belief that the content was removed in error. A statement that you consent to the jurisdiction of Federal District Court for the judicial district in which your address is located, or if your address is outside of the United States, for any judicial district in which Allnurses.com, Inc may be found, and that you'll accept service of process from the person who provided the original complaint. A physical or electronic signature (for example, by typing your full name). As with any large community, we ask that everyone follow our TOS (Terms of Service) which are a set of guidelines and rules. Some situations require staff judgement calls, and may not be spelled out in the terms of service. These Terms of Service are your agreements with us and by becoming a participant in ALLNURSES.COM and the online community, you agree to them and to abide by them in the same way as if you had signed a paper agreement with us. The Basic Terms of Service You agree NOT to post anything you wish to remain private on ALLNURSES.COM, INC as privacy is not possible on the internet. You agree NOT to post false, defamatory, name-calling, obscene, or threatening messages. You agree NOT to use profanity. You agree NOT to give out personal information about others. You agree NOT to post advertising or solicitations. You agree NOT to post any copyrighted material. You agree NOT to post for marketing or commercial research. You agree NOT to use titles that you have not earned. (RN, Dr, LPN, LVN, Nurse, etc) You agree NOT to spam ALLNURSES.COM, INC. You agree NOT to post in any other language except English. You agree NOT to argue publicly about policies or moderating decisions. You agree NOT to hold ALLNURSES.COM, INC responsible for any messages posted. You agree NOT to hold multiple accounts. You agree NOT to seek or offer medical or legal advice You agree to indemnify and hold ALLNURSES.COM, INC. harmless from damages caused by content posted or submitted. You agree that ALLNURSES.COM, INC. has a license to use and re-use your postings or other submissions however ALLNURSES.COM, INC. chooses and, unless ALLNURSES.COM, INC. agrees otherwise (as with a contest) ALLNURSES.COM, INC. does not have to pay you anything for ALLNURSES.COM, INC.'S use of your submissions and postings. You agree NOT to copy or otherwise use or reproduce the property of ALLNURSES.COM, INC. without ALLNURSES.COM, INC'S express written permission. Unless you have created and submitted the Content and have not assigned your rights to ALLNURSES.COM, INC. as provided in this Terms of Service or another written agreement with ALLNURSES.COM, INC., all Content on ALLNURSES.COM, INC.'S Website, Facebook Page or other digital or written media related to ALLNURSES.COM is the property of ALLNURSES.COM, INC. or the property of others and its reproduction is prohibited without express written consent of ALLNURSES.COM, INC. You acknowledge that you are 13 years of age or older, and, if under the age of 18, are using this site under the supervision of a parent, legal guardian, or other responsible adult. Children under the age of 13 are not allowed to visit or otherwise use our site. Social Media Sharing ALLNURSES.COM is a public site and is indexed by Google and other Search Engines on a daily basis. If there is something you are concerned about being public knowledge, you should not be posting it on ALLNURSES.COM or anywhere online. We occasionally share posts from ALLNURSES.COM on our Facebook page(s). No personal details are shared. What we share is publicly available on ALLNURSES.COM. We share the link to the page, any image found on the page, and a brief context from the page. Posting Information: Although the Constitution of the US guarantees that "Congress shall make no law abridging the freedom of speech", ALLNURSES.COM, INC is not Congress. Freedom of speech rights do not extend to ALLNURSES.COM, INC. This Terms of Service (Guidelines) governs the behaviors and activities of the members. If you choose not to follow the guidelines agreed to during registration, the result is disabling your account. You are not allowed to post libelous information about a person, school, instructor, health care facility, or entity. Any post which is violative of any law or is invasive of a person's privacy will be taken down immediately. We promote the idea of lively debate. This means you are free to disagree with anyone on any type of subject matter as long as your criticism is constructive and polite. Additionally, please refrain from name-calling. This is divisive, rude, and derails the thread. Our first priority is to the members that have come here because of the flame-free atmosphere we provide. There is a zero-tolerance policy here against personal attacks. We will not tolerate anyone insulting other's opinion nor name calling. Our call is to be supportive, not divisive. Because of this, discrimination, racial vilification and offensive generalizations targeting people of other races, religions and/or nationalities, or sexual orientation will not be tolerated. Foul Language / Profanity: Nothing should ever be posted here that you would not say in front of a crowd of professionals. ALLNURSES.COM, INC. staff have the right to edit offensive language. (Including profanity cleverly disguised - such as different spelling or a mixture of letters and symbols.) Information About Others: No potentially libelous information about specific schools, instructors, or health care facilities/entities should be posted in these forums. While it is important to be able to network, everyone should be mindful of the following: It is a small world - when we narrow it down to a state and throw in some personal info, there is actually a pretty good chance someone may recognize you if you are not careful. Your privacy is paramount to us. While this site is a wonderful place to vent (without excess personally identifiable details) it is not the place to express why ("x" specific person, place or program) is terrible. Gripe away, but since we cannot permit allegations to be made about named entities, your care in not naming them is very much appreciated. Please do not give out personal identifying information about yourself or others. Do not name names where anyone could identify any person in any facility including your nursing programs or place of employment. Advertising / Self Promotion: Please do not post any messages anywhere on this site that are primarily for the promotion or advertising of any website, email address, forum, business, MLM, activity, personal blogs, or other entities with which you have an affiliation including non-profit sites (ie. no self-promotion). We do not allow any form of commercial advertising in the bulletin board post, avatars, signatures, or user names. This includes using your avatar or signature to link to other websites or promotional messages that are advertising in nature. Please note, this includes links to political parties' websites. You may not post items to sell, purchase, or rent, including books, school supplies, uniforms, or any form of real estate. You may not invite, solicit or coerce others to join other community websites through posts, email, PM, use of ALLNURSES.COM, INC. membership list or any other resource within the ALLNURSES.COM, INC. We allow linking to other information websites, as long as it is for informational purposes and not for self promotion advertisement. Staff members may remove or edit links at their discretion. If you are interested in advertising to our nursing audience, please visit our Advertise With Us page. Copyrighted Material: No "spreading of copyrighted Material": Please do not upload, attach or post anything that is copyrighted or licensed without prior consent of the owner. For example, if you want to post content from an online article, do not post the whole article; post a partial synopsis, and then a link to the source. Please do not request or post test questions, test preparation materials, test bank codes, or post links to, or use this site to send or request via email or pm such material that is protected by copyright. THOSE POSTING SUCH TEST-RELATED COPYRIGHT MATERIAL WILL BE BANNED. Use of Submissions: We do not guarantee that your Content (messages, posts, reviews, articles, etc.) will appear on the website ALLNURSES.COM, our Facebook page, or any other digital or written media owned or controlled by ALLNURSES.COM, INC. Subject to any separate written agreement to the contrary that we may enter into with you regarding your Content, by providing Content, you grant ALLNURSES.COM, INC, and its licensees, successors and assigns, a worldwide, royalty free, perpetual, irrevocable, non-exclusive and fully sublicensable license to use, reproduce, modify, adapt, edit, publish, translate, create derivative works from, distribute, perform, and display your Content (in whole or in part) on the website ALLNURSES.COM, INC, our Facebook page or any other digital or written media owned or controlled by ALLNURSES.COM, INC. or in any other program, or in any advertising, promotion and publicity, in any form, in any and all media now known or hereinafter devised, throughout the world in perpetuity. 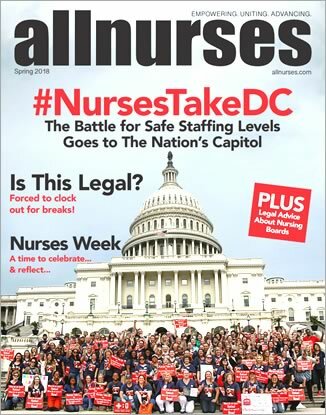 Subject to more specific crediting with respect to articles submitted, ALLNURSES.COM, INC. may, in its sole discretion, post or mention your first name, last name, city and/or state, in connection with use of your Content, without additional credit, compensation, notification, permission or approval. Solicited Articles: We may, from time to time, request that you and others submit articles or other Content for publication on the ALLNURSES.COM website or Facebook page as part of contests or other requests that provide payment to you or give you the chance to be paid, give you recognition or allow you to receive other benefits of publicity by reason of the submission. Subject to any other written agreement that we may separately enter into with you, any such Content that you submit will be the subject of a "check the box" online agreement. By checking "yes", you agree that in exchange for the benefits you receive or have a chance to receive, you hereby permanently assign to ALLNURSES.COM, INC. all your rights to publish, duplicate, display, transmit or link to the article or Content, and all previously submitted articles or Content of that you may have submitted to ALLNURSES.COM, in any tangible medium of expression, now known or later developed, from which it can be perceived, reproduced, or otherwise communicated, either directly or with the aid of a machine or device, including without limitation the rights to archive, republish, edit, repackage or revise any article or Content in any manner ALLNURSES.COM, INC. sees fit. ALLNURSES.COM, INC. shall also have the right to own or register any copyrights to any works or compilations hereby assigned by you or created by ALLNURSES.COM, INC. that contain the article or Content submitted by you, in whole or in part. This agreement shall benefit ALLNURSES.COM, INC and its successors and assigns and shall bind you and your heirs, administrators, successors and assigns forever. Commercial Research: You may not post for marketing or commercial research. Marketing / Research is strictly prohibited and member's account may be closed immediately. Research in the context of nursing graduate school is permitted. All submissions for academic research must be approved by the allnurses senior administrative staff before they can be posted on this site. Please read Academic Nursing Research Requests for more information. Using Professional Titles: Members cannot call themselves by professional titles, if they do not hold that title. ie. "doctor, Dr., RN, LPN, LVN, Nurse, CNA, RT, MA" etc, unless they are actually licensed and/or certified as such. Use of such titles is protected under most state laws. If you have chosen a user ID name that reflects an unearned professional title, please contact: Admin Office, and submit three (3) names for consideration. An administrator will contact you. No Spamming or Cross Posting in Multiple Forums Please do not spam forums with multiple posts in multiple forums. Moderators may move to most appropriate area. You can use the "search" feature to find topics of interest. English Only: While ALLNURSES.COM, INC hosts visitors from around the world, it is based in the United States and much of our membership is English speaking. Due to our inability to moderate threads in other languages, we ask that interactions be in English for the enjoyment of as many posters as possible. Please do not type entirely in capitals as it is considered shouting on the Internet. Staff reserves the right to address any issues of length, paragraphing, font size, or any other characteristic that makes a post difficult to read. Desiring to maintain professionalism, text speak (also known as chatspeak, txtspk, texting language or txt talk) is discouraged. Along with using proper English spelling and punctuation, this shows respect for the owner, other bulletin board members, guests, and makes it easier to read your message. Disagreements with Policies or Staff Decisions: You agree not to argue about policies or moderating decisions in the public forums. If you disagree with a policy or a decision, you may respectfully post your comments in private in the Admin Office. You will not attempt to petition the website owner through the use of posts, polls, emails, PMs or any other method found on ALLNURSES.COM, INC. Messages Posted - Responsibility: Considering the real-time nature of ALLNURSES.COM, INC., it is impossible for us to review all messages or confirm the validity of information posted. We do not actively monitor the contents of every message posted on ALLNURSES.COM, INC. We do not vouch for or warrant the accuracy, completeness or usefulness of any message, and are not responsible for the contents of any message. You agree to indemnify and hold ALLNURSES.COM, INC. harmless against any claims asserted by any third parties that allege the Content submitted by you violates the third parties' rights, or from any breach by you of any promises, warranties or representations contained in these Terms of Services. You shall be responsible for any costs incurred by ALLNURSES.COM, INC. for defense or settlement of third party claims, including but not limited to our attorneys' fees. The messages express the views of the author of the message, not necessarily the views of ALLNURSES.COM, INC., it's owner, or any entity associated with ALLNURSES.COM, INC. Any user who feels that a posted message is objectionable is encouraged to contact us immediately using the report button. We have the ability to remove objectionable messages and we will make every effort to do so, within a reasonable time frame, if we determine that removal is necessary. Multiple Accounts: Creation of multiple accounts is prohibited. Members with multiple accounts are required to merge their accounts with the help of an Administrator. If one or more accounts are found to be created for the express purpose of trolling, flaming, or continually not complying with the Terms of Service, all accounts will be closed without further notice. If you need to change your user ID name after the registration is complete please contact administration in the Admin Office and submit three (3) choices for consideration and your rationale for the change. An administrator will contact you if one of the names is available. Medical Advice: ALLNURSES.COM, INC. or its members do not offer medical advice. Any requests for such will be removed. If you have a medical problem, please seek attention from your healthcare provider. You are not allowed to ask for medical advice related to a health situation that affects you, a family member, or someone you know. Legal Advice: ALLNURSES.COM, INC. or its members do not offer legal advice. Any requests for such will be removed. If you have a legal problem, please seek legal counsel. Disclaimers, Limitation of Liability, Consent to Jurisdiction The disclaimers and limitations of liability in this section apply to the maximum extent allowable under applicable law. Nothing in this section is intended to limit any rights you have which may not be lawfully limited. You are solely responsible for your interactions with advertisers and other users and ALLNURSES.COM, INC is not responsible for the activities, omissions, or other conduct, whether online or offline, of any advertiser or user of ALLNURSES.COM, INC. ALLNURSES.COM, INC is not responsible for any incorrect, inaccurate, or unlawful Content (including any information in postings, profiles, advertisements, or other locations) posted on ALLNURSES.COM, INC, whether caused by users or by any of the equipment or programming associated with or utilized by ALLNURSES.COM, INC. ALLNURSES.COM, INC does not endorse and is not responsible for statements, advice or opinions made by anyone other than ALLNURSES.COM, INC. ALLNURSES.COM, INC assumes no responsibility for any error, omission, interruption, deletion, defect, delay in operation or transmission, communications line failure, theft or destruction or unauthorized access to, or alteration of, any communication with advertisers or other users. ALLNURSES.COM, INC is not responsible for any problems or technical malfunction of any hardware and software due to technical problems on the Internet or on ALLNURSES.COM, INC or combination thereof, including any injury or damage to users or to any person's computer related to or resulting from participation or downloading materials in connection with ALLNURSES.COM, INC. Under no circumstances shall ALLNURSES.COM, INC be responsible for any loss or damage resulting from use of ALLNURSES.COM, INC or from any Content posted on ALLNURSES.COM, INC or transmitted to users, or any interactions between users of ALLNURSES.COM, INC, whether online or offline. ALLNURSES.COM, INC is provided "as-is," "with all faults," and "as available" with the express understanding that ALLNURSES.COM, INC is under no obligation to-and may not-monitor, control, review, or verify user or advertiser content. You use ALLNURSES.COM, INC at your own risk and discretion. ALLNURSES.COM, INC makes no claims, representations, warranties, or promises about the quality, accuracy, or reliability of ALLNURSES.COM, INC content or the safety or security of ALLNURSES.COM, INC ALLNURSES.COM, INC expressly disclaims any warranties and conditions of any kind, whether express or implied, including the warranties or conditions of merchantability, fitness for a particular purpose, title, quiet enjoyment, accuracy, or non-infringement. ALLNURSES.COM, INC makes no warranty that: (1) ALLNURSES.COM, INC will meet your needs or requirements; (2) ALLNURSES.COM, INC will be available on an uninterrupted, timely, secure, or error-free basis; (3) that third-party content on ALLNURSES.COM, INC will be accurate or reliable, or (4) you should rely on the quality, accuracy, or reliability of any third-party content on ALLNURSES.COM, INC such as user comments or contributions, advertisements, or sponsored content. You hereby release ALLNURSES.COM, INC from any and all claims, demands, losses, damages, rights, and actions of any kind that are either directly or indirectly related to or arise from: (1) your interaction with ALLNURSES.COM, INC or its affiliated sites or (2) any interactions with other users or advertisers of ALLNURSES.COM, INC. Your sole and exclusive remedy for any claims or concerns you have with the use of ALLNURSES.COM, INC shall be to discontinue use of or access to ALLNURSES.COM, INC. IN NO EVENT SHALL ALLNURSES.COM, INC BE LIABLE TO YOU OR ANY THIRD PARTY FOR ANY LOST PROFIT OR ANY INDIRECT, CONSEQUENTIAL, EXEMPLARY, INCIDENTAL, SPECIAL, OR PUNITIVE DAMAGES ARISING FROM YOUR USE OF ALLNURSES.COM, INC, EVEN IF ALLNURSES.COM, INC HAS BEEN ADVISED OF THE POSSIBILITY OF SUCH DAMAGES. NOTWITHSTANDING ANYTHING TO THE CONTRARY CONTAINED HEREIN, WHERE PERMITTED BY APPLICABLE LAW, YOU AGREE THAT ALLNURSES.COM, INC'S LIABILITY TO YOU FOR ANY DAMAGES ARISING FROM OR RELATED TO YOUR USE OF ALLNURSES.COM, INC (FOR ANY CAUSE WHATSOEVER AND REGARDLESS OF THE FORM OF THE ACTION), WILL AT ALL TIMES BE LIMITED TO THE GREATER OF (i) THE AMOUNT PAID, IF ANY, BY YOU TO ALLNURSES.COM, INC, OR A RELATED ENTITY, IN THE 12 MONTHS PRIOR TO THE ACTION GIVING RISE TO LIABILITY, OR (ii) ONE HUNDRED U.S. DOLLARS ($100). YOU AGREE THAT ALL MATTERS RELATING TO YOUR ACCESS TO OR USE OF ALLNURSES.COM, INC AND ALL MATTERS ARISING OUT OF OR RELATED TO YOUR USE OF ALLNURSES.COM, INC, INCLUDING ALL DISPUTES, WILL BE GOVERNED BY THE LAWS OF THE STATE OF MINNESOTA, UNITED STATES OF AMERICA, WITHOUT REGARD TO MINNESOTA'S CHOICE OF LAW PRINCIPLES. YOU FURTHERMORE AGREE THAT THE EXCLUSIVE FORUM AND VENUE FOR ANY LEGAL ACTION ARISING OUT OF OR RELATED TO THE USE OF ALLNURSES.COM, INC SHALL BE THE UNITED STATES DISTRICT COURT FOR THE DISTRICT OF MINNESOTA, AND YOU SUBMIT TO THE PERSONAL JURISDICTION OF THAT COURT. IF SUBJECT MATTER JURISDICTION (INCLUDING DIVERSITY JURISDICTION) DOES NOT EXIST IN THE UNITED STATES DISTRICT COURT FOR THE DISTRICT OF MINNESOTA, THEN THE EXCLUSIVE FORUM AND VENUE FOR ANY SUCH ACTION SHALL BE THE COURTS OF THE STATE OF MINNESOTA LOCATED IN HENNEPIN COUNTY, AND YOU SUBMIT TO THE PERSONAL JURISDICTION OF THOSE COURTS. Breach of Terms of Service ALLNURSES.COM, INC staff reserves the right to edit/remove the posts and/or disable the account of any member who does not comply with these guidelines or any reason deemed appropriate by the administration for the safety and good of the community. Requests for account removal will entail removing personal data such as location, avatar, signature, etc to protect the privacy of the person but the member account and postings will remain intact because of the nature of the threading of posts within the database. Problematic posts/threads may be deleted or closed. Threads are closed to cool down passionate postings that have strayed off the original topic; we will attempt to post warning notice before taking this action. Please note, the administrators do have the ability to read private messages. How to Handle Personal Attacks or Objectionable Material We are the largest peer-to-peer nursing community on the Internet. We are dealing with almost 1 million members. Presently, we have 20+ volunteer moderator and admin staff who monitor this board periodically. They are here to help -- please feel free to contact them with any problems you may have. They have been instructed to enforce our zero-tolerance policy. Our biggest concern here is the quality of membership not the quantity. We have no problem removing any individual who disrupts this bulletin board. If you are in a position where you feel you have been personally attacked, do not respond to that attack. Please report the post by clicking on the report button found within the message. (Triangle in the left-hand corner of each post). Expectations of the Administrators Members who repeatedly violate these standards after given a warning will be reported to the administrator. Only the administrator can make the decision to BAN a poster and ALL decisions of the administrator are FINAL. You will enjoy a great deal of freedom here, with the ability to freely debate upon a number of subjects, as long as you remain civil and polite to each other. You are among the most intelligent, friendly, experienced, passionate and vocal nursing posters anywhere on the Internet. You are part of a site whose opinions are widely read by men and women considering nursing, nursing assistants, students from around the world. This website is one of the most highly respected within the nursing community and is listed as a resource in nursing publications and at other nursing related websites. We didn't get to that status without the professional and courteous contributions of our membership. We welcome you to a place you will soon call home. Thank You for joining our Nursing Community! September 2018 Caption Contest: Win $100! Congratulations CalicoKitty. You won $100! You won $100! Your entry was selected by the community as the best caption for our September 2018 Caption Contest - Select $100 Winner! Cartoon can be viewed at The 'Q' Word During a Full Moon.